Moist, soft, and sweet, this glazed Coconut Bread is perfect with a cup of tea or coffee! A simple quick bread that comes together in minutes, with no mixer required. 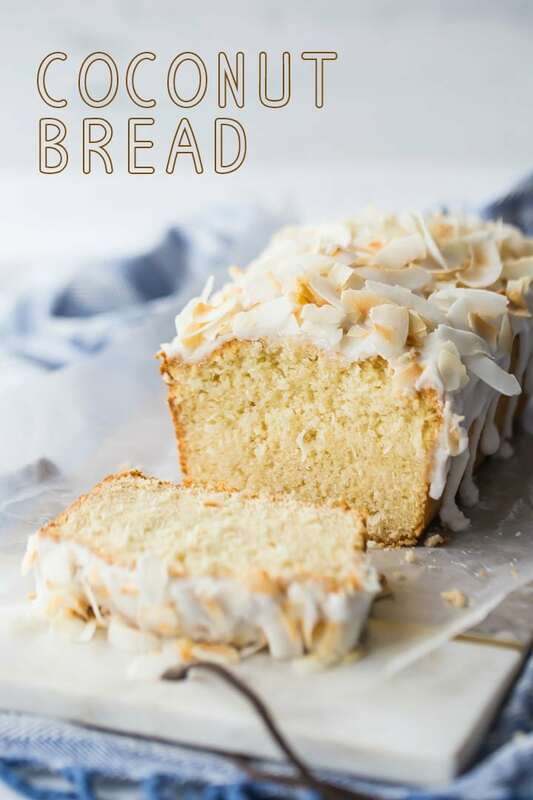 I’m so excited to share this coconut bread with you today! There is just something about a quick bread. They’re like, maximum impact with minimal effort. Just stir a few dry ingredients together, add a few liquid ingredients, pour it in a loaf pan and boom. Incredibly delicious treat. And there is no better time to enjoy coconut than right now! Someone left a comment on one of my Instagram posts this week saying “Easter owns marshmallow.” I couldn’t agree more, but when I think of Easter I also think of coconut. And pineapple! 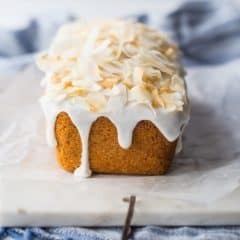 These are all fan-freaking-tastic, but if you’re in kind of a last-minute situation, I think this coconut bread is the way to go! It makes a great breakfast, brunch, or afternoon snack, and it’s moist and just sweet enough, with a buttery richness and plenty of tropical coconut flavor. We’re using coconut milk, sweetened shredded coconut, and coconut extract, so there’s no doubt about it! It’s all coconut. Once the bread has cooled, glaze it with a coconutty powdered sugar icing, and top it with big shards of toasted coconut. I’ve used the unsweetened kind, to balance the sweetness and also just because I love the look of those big curls! Just toss them around in a dry pan over medium heat. They start to brown pretty fast, so keep them moving! If you’ve got overnight guests coming this holiday weekend, make them this coconut bread! It makes a perfect breakfast, brunch, or afternoon snack. Preheat the oven to 375 degrees F and mist a loaf pan with non-stick spray. Place the flour, coconut, sugar, baking powder, and salt in a medium bowl and stir to combine. Place the coconut milk, melted butter, egg, and extracts in a large liquid measuring cup, and whisk to combine. Pour the liquid ingredients into the dry, and fold together just until combined. Transfer the batter to the prepared pan, and bake for 55 to 65 minutes, or until a toothpick inserted in the thickest part of the bread comes out clean or with a few moist crumbs. Cool for 20 minutes in the pan, then invert onto a wire rack to cool completely. Lightly toast the coconut flakes in a dry pan over medium heat, until just beginning to turn brown. Set aside. Place the powdered sugar in a medium bowl and add the coconut milk and coconut extract. 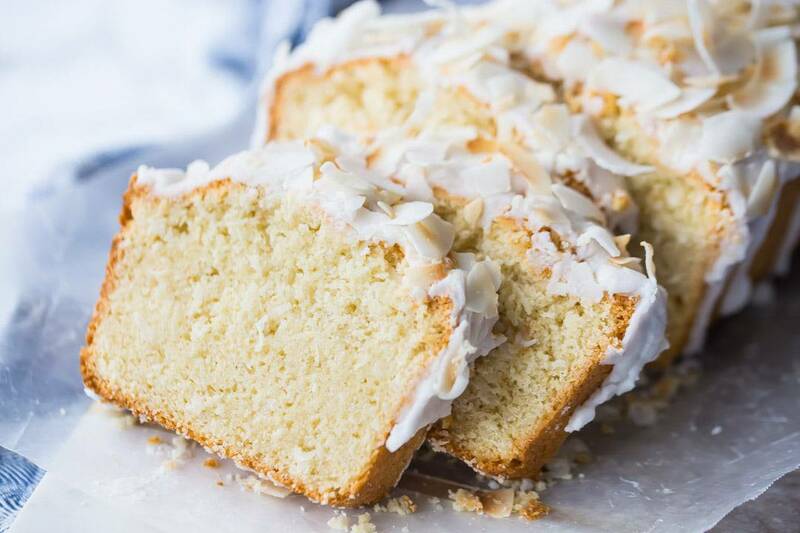 Stir together until smooth, then drizzle over the coconut bread and top with toasted coconut flakes. What a gorgeous loaf! I can never pass up a coconut treat! I’m drooling over this one 🙂 Cant wait to try! Allie, this recipe looks delicious, but your Snowball Cupcake recipe was too enticing not to click on. Then I saw you did a video and I said it before, but you are just too darn cute! Marshmallow frosting on top of your delectable chocolate cupcakes–Heaven! Hope you and your family have a Happy Easter. 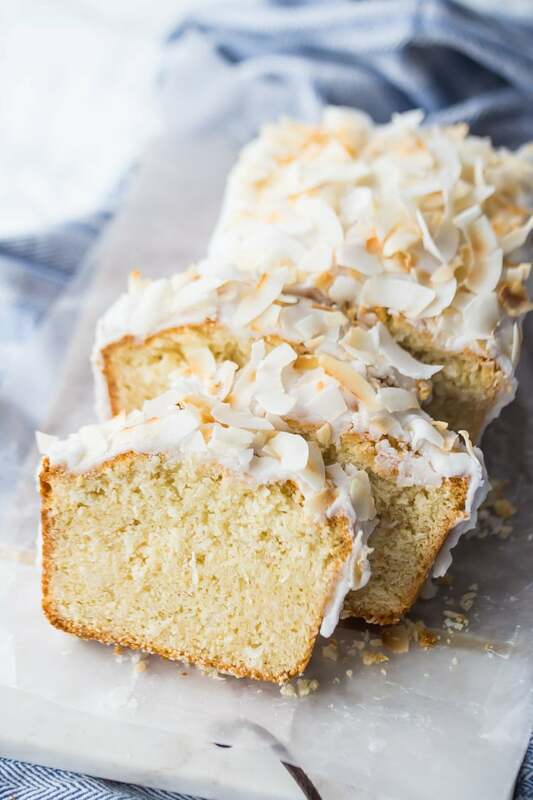 Perfect for coconut lovers! Love that chunky coconut on top. Oh my gosh, thank you for this recipe! I have so much sweetened shredded coconut left over in my pantry, and I needed a recipe to use it all up! Perfect! Hope you enjoy Bhiravi! Girl, you make the pretties food! this is a great looking cake! Such a great treat for coconut lovers! Love the pic & recipe, however I wish that comments would take more of a review approach. 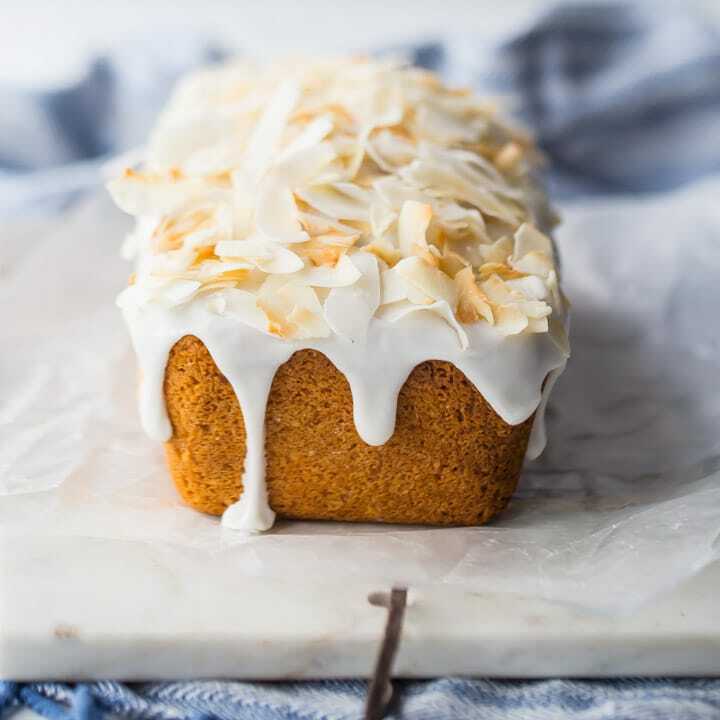 That would help us all decide whether or not we want to try this gorgeous looking coconut bread! It seems to be the norm with all internet recipes across the board, not just this one. We as readers/bakers want the invaluable input from folks that actually used the exact recipe, followed by an accurate rating…seems fair enough, right? Hi Vina! I would love to have more reviews on all my recipes but unfortunately that’s not up to me- it’s up to the reader! If you decide to make this, I’d love your feedback. You can comment as well as leave a star rating. It would be really helpful if you could get that ball rolling on this post. Thanks!